To reduce the signs of fatigue, smooth the features and even out the complexion. The skin radiates with freshness, its youth appears preserved. Sothys Vitality Youth Cream is an exclusive BP3 Tri-complex anti-aging cream that reduces fine lines and loss of radiance. Replacing Sothys Anti-age Cream Grade 1, it helps to reduce the signs of fatigue, smooth the features and even out the complexion.. Containing Sothys exclusive BP3 Tri-complex™, it protects the skin, along with a pool of specific active ingredients that target the signs of chronological aging. ßP3. Sothys Vitality Youth Cream fights against oxidative stress with Saffron and Sophora flower extracts and Peptides while visibly limiting the appearance of wrinkles and skin sagging. Signs of fatigue are dramatically reduced. The complexion gains an even tone. The skin radiates with freshness. Citrus, floral, powdery scent. Great for all skin types. All skin types * Self-evaluation of 146 people from 24 to 85 years old, having used one of the 7 Youth creams according to their specific anti-ageing expectations. 30 days of use day and night. Liposome Complex (dipeptide & milk thistle) - Visibly smooths the wrinkles while fighting against glycation. After cleansing, apply your routine lotion and serum. Take a bean size amount of Youth Cream and gently massage onto face and neck. Suitable for daily use (morning and night for best results). 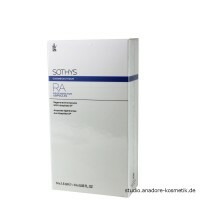 Like all Sothys products this cream is terrific. The Vitality Youth cream leaves my skin feeling moisturized and fresh.